In-house wireless internet & cable channel. Unlimited local calls. Capped utility bills. 5-minute walk to the Paya Lebar subway. 10-minute drive to Raffles Place & Suntec City. Buses and taxis available. Unique conservation or heritage shophouse living for expatriates looking for such type of historical accommodation rarely found in Singapore. 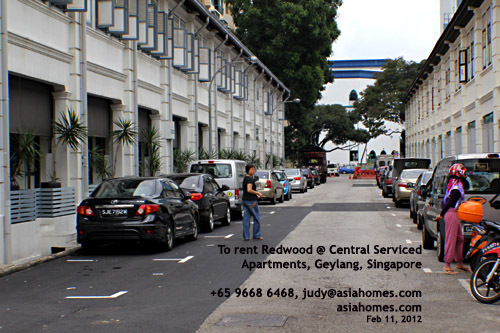 Expats/Secretaries or INSEAD students wanting us to book Redwood West or Redwood Central for less than 6 months will have to pay an administrative fee of S$200/apartment booked to Asia USA Realty in advance. Fees will be $50 per person if there is a large group booking, e.g. 50 persons sharing apartments. A direct bus brings students to INSEAD in less than 5 minutes. Services include advices on tenancy agreement, faxing, email, trunk calls and lots of liaison work with the management to ensure that you have the apartment when you reach Singapore. No apartment viewing is included in this service. E-mail judy@asiahomes.com or tel/sms +65 9668-6468 for latest updates and terms and conditions.